Coastguards disposed of four emergency flares after they were discovered abandoned near the Wyre estuary. The four flares were discovered on Sunday by Blackpool dog walker Mark Lewis by the nature reserve. Mr Lewis contacted Fleetwood Coastguard who were sent to dispose of them. 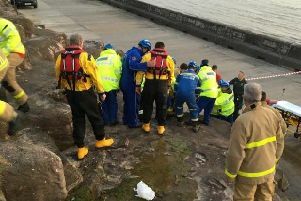 The coastguard said they had received reports of “pyrotechnics being found” and a team was sent out to investigate. They undertook a safety inspection of the flares and discovered some of them were more than 25 years out of date. The flares were packaged safely and sent to the Crosby coastguard operations base where they can be disposed of safely.